Every now and then I get some amazing emails from clients I’ve worked with in the past. 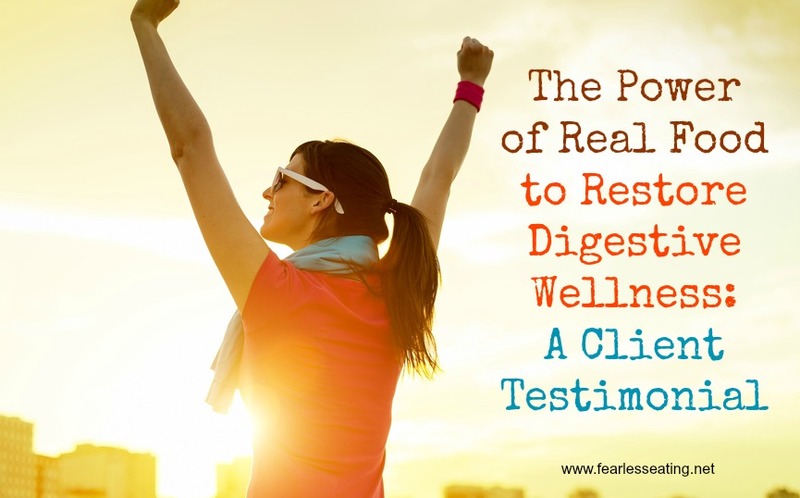 I love hearing how my work has helped them and how the power of real food has helped them restore digestive wellness – how it’s stopped the bloating, the heartburn, the intestinal pain, the IBS or whatever issues they’re dealing with. It just makes me feel great to know that what I’m doing is helping others. This happened again the other day but this email was different than other testimonials I’ve received. Hands down, the greatest testimonial I’ve ever received. And it was from someone who’s done my digestive wellness program. And yes, maybe I’m bragging a little by sharing it. But it also exemplifies the power of real food and what it can do for people. I wanted to write and let you know that I am still so thankful for the valuable knowledge I gained from your program. I’m not sure a day goes by that you don’t come to mind in some way — whether it’s seeing an article about real food, or making homemade bone stock (seriously — my FAVORITE), or bacon or butter…LOL! My point is, I realize that what I learned from you isn’t a fad diet or some get-skinny-quick scheme. You’ve helped me create a lifestyle that works, based on age-old concepts that have taken a back seat to mainstream propaganda. Aligning with my ancestral roots has created a sense of grounding and connectedness. My biggest focus in the past was on my weight. And yet, I never made the connection to my gut health, which was never quite right. I was so defined by the number on that scale. I love the way you helped shift the focus to healthy eating and concentrated on my digestive health without putting much stock (pun intended) into weight loss. I realize now exactly why you did that. By focusing on eating real, healthy foods, and avoiding sugar and certain types of grains (which I’ve done for almost a year now), I naturally feel better. My gut issues were the first to go and the rest kinda took care of itself. The weight has naturally fallen off. I’m energized, I get up earlier, and have started becoming more active. I’m actually EXCITED to eat nutritious foods that allow my body to perform at its maximum level and I feel better than I ever have. So today, while I was eating my homemade egg drop soup using my homemade bone stock, I felt compelled to write and say thank you. I have never felt this motivated, this healthy, or this alive in my life. You’ll forever be part of that, and I’ll forever be grateful. I know…WHOA. I had to grab a tissue after that one. Greatest testimonial EVER. Now I know there are a lot more Cheryls out there. In fact, I was like Cheryl once too. I wandered around the nutritional wilderlands for many years trying this dietary approach and that dietary approach, this detox program and that detox program, all the while seeing this medical specialist and that medical specialist, knowing all along that things were not right in my gut. And then I found the world of real, traditional food. I loved food again. I didn’t have to deny myself anymore. And I learned how to make the most heart-stopping-drop-dead UNBELIEVABLY delicious meals I could ever dream to make. And that’s even more incredible when you consider I possessed ZERO cooking skills. Oh and those digestive issues faded away too. How wonderful it was to not walk around feeling bloated and sick to my stomach all the time. So now I consult with people privately and help them navigate through their digestive issues like I did with Cheryl. But there’s only so many people I can work with at one time. However, pretty soon, that will be changing. My online digestive wellness program will soon be available to anyone, anywhere in the world. I’m SO excited to share it when it’s ready and to be able to help more people just like Cheryl (and myself). But I’m still a few weeks away. Still working to get all those little (and not-so-little) techy things finalized. In the meantime, you can sign up for my newsletter right here, where I’ll notify my subscribers when the program is finally ready.